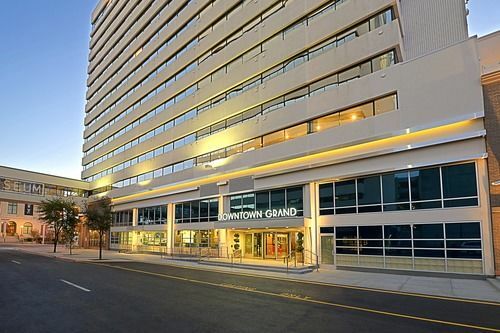 The Downtown Grand is located in the very heart of downtown Las Vegas at 206 North 3rd Street, near Fremont Street. The Downtown Grand is located in the very heart of downtown Las Vegas and is specifically designed so that everybody can have a fabulous time in the entertainment capital of the world. It lies just a few minutes’ walk from the famous Fremont Street Experience, which offers a plethora of entertainment options, with the legendary Las Vegas Strip not much further away. The hotel offers a myriad of amazing amenities, foremost of which is the Citrus Grand Pool Deck, the largest pool deck in the entire of downtown Vegas: an ideal place to relax in the hot Nevada sun. It also features a state of the art gym, where guests can maintain the fitness regime, free parking, and WIFI throughout the property. It also offers several bars and restaurants, including a state of the art entertainment facility, where you can catch live performances from local and more established artists. The casino attached to the property is the perfect place to get your Vegas gambling fix: offering a multitude of slot machines and table games. This is combined with a full sports book, allowing you to enjoy watching sport on huge televisions, with something riding on it. 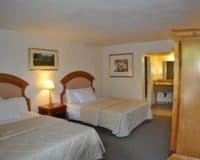 The guest rooms all feature gargantuan forty-inch flat-screen HD ready televisions, with cable built in along with an ergonomic workspace and high-quality en-suite bathrooms. The rooms are also comfortable and spacious, meaning that you can relax and get a good night’s sleep during your Vegas stay. 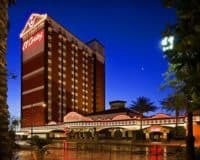 The Downtown Grand combines a phenomenal location close to the Mob Museum, with excellent facilities to provide a wonderful and relaxing Vegas experience. This makes it ideal for anyone who wants to sample the legendary nightlife of the entertainment of the world.